Nothing was going to put a damper on the pre-K2013 press conference organised by Austria-based injection moulding machinery maker Engel on 3 June at its plant in Schwertberg, not even the rain! 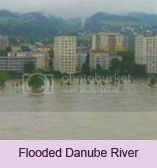 With 2 months of rain over two days, the Danube river flooded parts of the country. Speaking about the company’s business, Neumann said it had recovered faster than expected over 2010/11 period. “It is surprising even for us. The global turnover of EUR950 million this financial year (2012/2013), will be the best ever in Engel’s history.” He also said that two years ago, the management envisaged the recovery to reach EUR600, “and we would have been happy if we had but we have done better.” He attributed the better performance to the fact that the global plastics industry’s move to a more higher technology, where Engel is in. Meanwhile, the markets in Southeast Asia are also expanding rapidly, particularly in Thailand and Indonesia, he said, adding that Engel has been able to triple its turnover over the last two years, despite a weak 2012/2013. The proudly family owned business is now moving to another level and Neumann introduced a new addition to the business, the fourth generation family member, Stefan Engleder, CTO. With eight facilities, 29 subsidiaries and 60 agents, 95% of sales is through Engel employees; strong relationship with customers. Its plants are all over the world in Austria, US and Asia; focusing on specific machines with robots in the UK and in China and Korea on large and small machines respectively. Since the last K in 2010, the firm has not only in capacity but also in technology. For instance at Schwetberg, it invested EUR23 million; St Valentin, EUR15 million, while in Shanghai, it doubled capacity for its big machines (EUR12 million investment) and in Korea, it is able to produce 1,000 machines (EUR8 million investment). In Stuttgart, it set up Technology Forum. In terms of new machinery at the K show, the firm will introduce the all-electric tiebarless Emotion TL and the E-speed for packaging applications.